If you like pumpkin, you're gonna love this recipe. It's a little slice of heaven on a plate for brunch, brekky, or even as a dessert. Not a healthy dish, sorry. But oh SO yummy. I'm a big crepe fan from way back. But I've always made them with a thin flour batter, more like really thin pancakes. This recipe is - I think - more like a real crepe ought to be made, although a real chef would probably GAK at the way I made them. Sloppy, don't ya know. But so what if my crepes had jaggy edges. They were yum-delicious. They were so good, I ate a couple nekkid, with no filling or topping! The filling: Combine maple syrup and puree and stir until smooth. Set aside. Combine eggs, milk, vanilla, cornstarch, sugar and pumpkin. Whisk until smooth. Brush non-stick skillet with melted butter. Place over moderate heat until pan begins to smoke. Remove from heat and ladle about 3 tablespoons batter in center of pan. Quickly tilt pan in all directions to spread batter. Return pan to heat; cook until crepe is set and underside has browned lightly. Flip crepe and cook 2 or 3 seconds longer. Slide the crepe out onto parchment paper or a cooling rack. Repeat, making about 15 crepes. 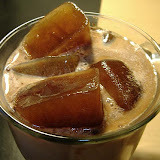 May be made ahead and refrigerated or frozen. Cool crepes (or, if made ahead, warm to room temperature). Lay out crepes with brown side down. 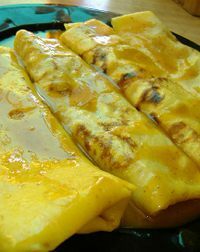 Spread each crepe with a very thin layer of pumpkin puree, about 2 teaspoons. Fold crepe - I prefer to fold them like a burrito, ends first, then one flap folded about 1/3 of the way in, then fold it all up like an envelope. But any kind of fold you like will do. The original recipe said "half and then half again" which would result in a sort of quarter pie. Melt butter in a skillet over low heat. Stir in remaining ingredients, whisking until smooth and sugar dissolves. Sauce may be made in advance and reheated gently. To serve: Place crepes on plate and pour butter sauce over them. I used canned pumpkin puree for these because it was easy. But if you feel ambitious, you could make your own. Get a good, sweet pumpkin (New England, Sugar Pie or Baby Pam are recommended rather than the big generic ones you get at this time of year for carving), remove seeds and other innards, cut into pieces and bake in the oven at around 400 degrees for an hour or so. Then just mash up the insides. If it's too watery, you can let it drain in cheesecloth. Frankly, I'd rather just buy the stuff, but then, I have no trouble admitting I'm a lazy git. It looks so good i will defenetely try this recipe and good to know how to use pumpkin in different ways nice and yummy although not very good for a diet but good option to do when friends come by. hiuk.. I like creeps but without pumpkins... How could i spoil that delicious thing?? I see this and want to eat them now!! Who cares what a chef could say... this taste better than any other restaurant crepe~!! I made this for guests at our Bed & Breakfast - they LOVED it. Me too! The only change I would make would be to halve the butter sauce. They looked really pretty on a plate served with two-potato gratin and sundried tomato and basil chicken sausage. Thanks for sharing! 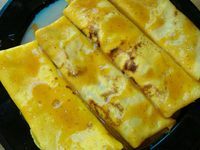 I am looking for a pumpkin crepe recipe for me to modify. This looks good. I got an idea after eating a pumpkin roll. I am gonna try to make a pumpkin crepe and roll it with a sweet cream cheese type filling. Some of the stuff I am kind of "winging" it. I will let you know how it turns out. Hey Vicki, how do you make blintzes? Share, share! Yeah, pecans sound like they'd go great. I had to get over my Jewishness and how I make blintzes before the recipe registered as being absolutely marvelous. I'm pumpkin crazy so will try the recipe. Living in the south, I imagine a sprinkling of pecans wouldn't hurt!